This is plate 21 from William Hodges' 'Select Views in India'. 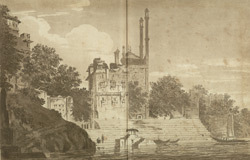 In 1783 Hodges went to Varanasi (also known as Benares). This picture shows some of Varanasi's famous riverside buildings facing the Ganges. The steps of the Panchaganga Ghat lead down to the river. The domed building with tall minarets, rising above it in the background, is the Alamgir Mosque, built in the late 17th century.